Paige arrived yesterday with these gorgeous cupcakes. 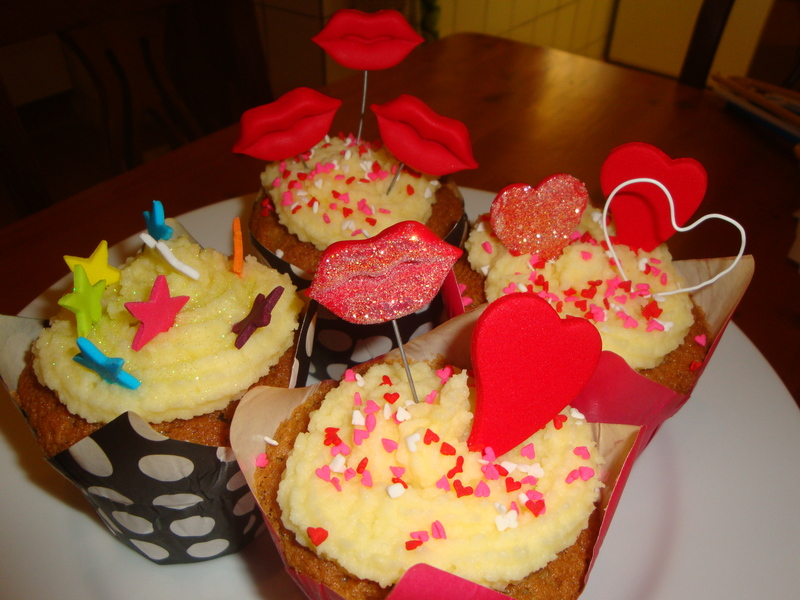 They were Nigella Lawson’s coffee cupcakes artistically decorated with lips, hearts and stars. It was great to taste a cupcake I hadn’t made and they were delicous so this will be my next recipe to try out. Of course Teigh was delighted with this gorgeous show of affection so many hearts and kisses a sign of true love and don’t they say the way to a man’s heart is through his stomach. Well Paige you certainly have found your way into Teigh’s heart and of course into ours with your bubbly and creative personality. Thank you for a wonderful surprise. Your cupcakes looked lovely Paige. An amazing result for a first timer! We were also lucky to sample them at home. Please keep them coming……….. I agree Tracy, Paige could be tne Next Great Cupcake Maker! Oooooh Lisa – looks like you have competition dear! They really are pretty. Teigh must have been over the moon ……………. I definitely do but at least it will keep me on my toes or should I say in my apron! Yes Teigh was thrilled.